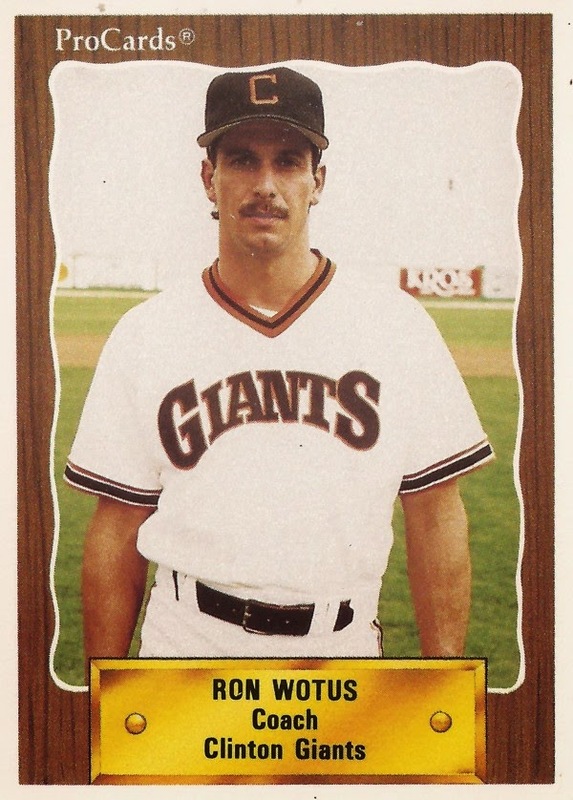 Ron Wotus made it back to the majors in 1998 as a coach with the Giants and he was still with the team in 2011, a World Series ring in his pocket. Wotus, who played parts of two seasons in the bigs with the Pirates, told MLB.com in 2011 he knew how lucky he was to be with one organization so long. "I really appreciate the fact that (general manager) Brian (Sabean) and the organization value what I do," Wotus told MLB.com that June. "I wouldn't be here for 13 years. That's the bottom line. I'm very fortunate. It's a great position and a great place to work." Wotus has since stayed with the club - and picked up two more World Series rings. Overall, Wotus has spent more than three decades in the pros as a player and coach. He's also had at least two interviews for major league manager jobs. Wotus' career in baseball began in 1979, taken by the Pirates in the 16th round of the draft out of Bacon Academy High School in Connecticut. Wotus started in the rookie Gulf Coast League. He made AA Buffalo and AAA Portland in 1982. In September 1983, Wotus debuted in Pittsburgh. Wotus got into five games that year and 27 games in 1984. In August 1984, Wotus got a chance due to an injury. He knocked in a run on a double in one start. "A chance to play. That's all I've been waiting for," Wotus told The Pittsburgh Post-Gazette after that game. In those 32 games between 1983 and 1984, Wotus hit .207. Those games also marked the extent of his major league playing career. He stayed with the Pirates at AAA through 1986. He then played a season with the Royals at AAA Omaha. In 1988, he arrived with the team that would later bring him back to the bigs, not as a player, but as a coach. Wotus played two seasons at AAA Phoenix, his last in 1989. In 1990, he took a job with the Giants as a coach in the minors, at single-A Clinton. He moved to high-A San Jose in 1991, then AA Shreveport in 1993. He returned to Phoenix as a coach in 1996. Then, in 1998, he arrived back in the majors as a coach in San Francisco. In October 2000, the Giants bench coach interviewed with the Pirates for their managerial job. Wotus stayed with the Giants, going with them to the 2002 World Series, then helping the club win the 2010, 2012 and 2014 World Series. In late-2013, Wotus got another managerial interview, one with the Mariners. But he was again passed over. "I'm glad to be right where I'm at, trying to get our team together and get us going here," Wotus told CSNBayArea.com that November after the Mariners went with Lloyd McClendon. "I love it in San Francisco. I'm excited about the upcoming year. This is where I want to be, obviously, and if someone wants to talk about a managing position, I'd definitely do that and weigh all options."